Actually, downloading podcasts to iPod is not as difficult as this Apple user thought. Today, I would like to introduce several methods to teach you how to download podcasts to iPod. 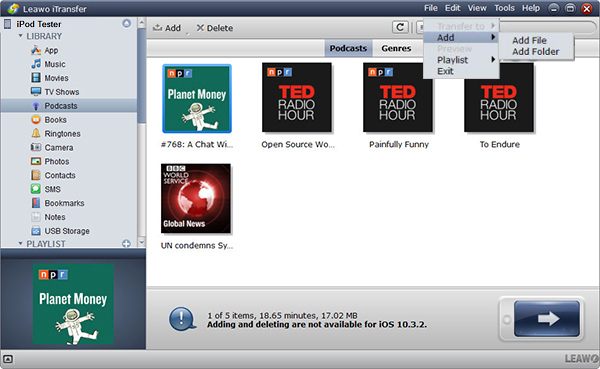 Apple devices are often pre-installed with Podcasts app at the very beginning. This iPod podcast downloader is typical for providing users with different kinds of interesting podcasts and allowing users to download podcasts to iPod and listen to them offline. Now the following steps will show you how to download podcast to iPod. 1. Tap on iPod podcast downloader – Podcast app on your iPod. 2. You can see five categories at the bottom of the interface. 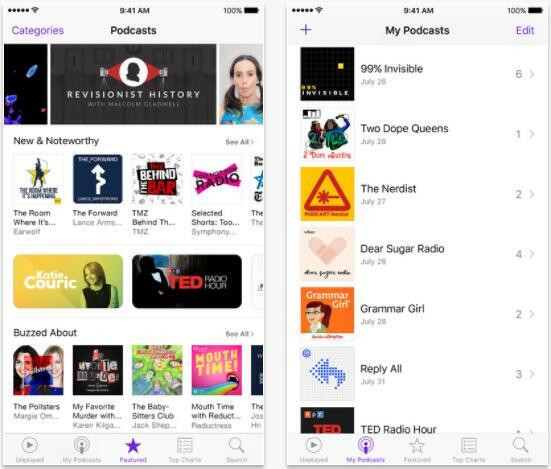 You can check "Featured" to see what kind of podcasts you want to download or go to "Search" to enter podcast name. 3. When you search some podcast, searched result will show. Click it to enter the podcast page. 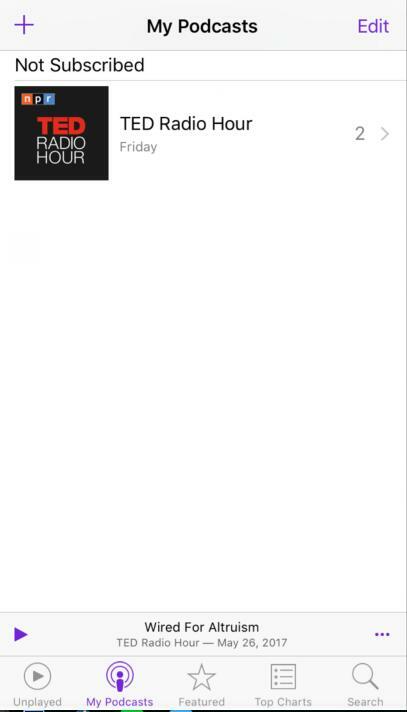 You can see a cloud icon next to "Download Episode". Tap on it to download podcasts to iPod. 4. After it is downloaded, you can go to "My Podcasts" to check it and listen to it offline. iTunes is a music paradise that offers different genres of songs, podcasts, audiobooks, etc. This iPod podcast downloader also enables users to sync various types of purchased contents like music, books, podcasts, etc. from iTunes to iPod, iPhone and iPad. If you want to download podcasts to iPod with iTunes, you can see the following steps to learn how to download podcast to iPod. 1. Launch iTunes and make sure it is the latest version. If there is a dialogue popping up, you can follow the command to download the latest iTunes version. 2. Click "Store" and enter podcasts name on the search box. The search results will show and you can select one as you like. 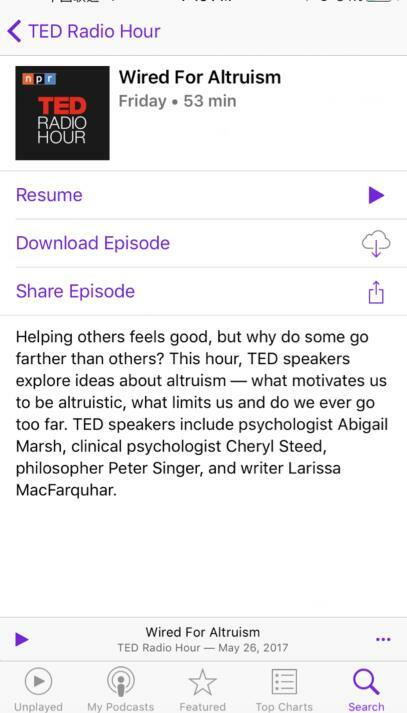 If you want to download a single podcast, click Get button next to the podcast and download it. 3. Connect your iPod to computer via USB cable and tap on iPod icon in the upper left. 4. 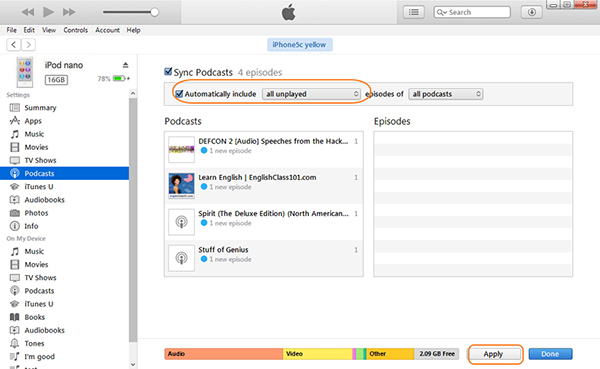 Select "Podcasts" in the left sidebar and check "Sync Podcasts". Afterwards, tap on "Apply" to sync podcasts with iPod. In this way, you finish downloading podcasts to iPod. 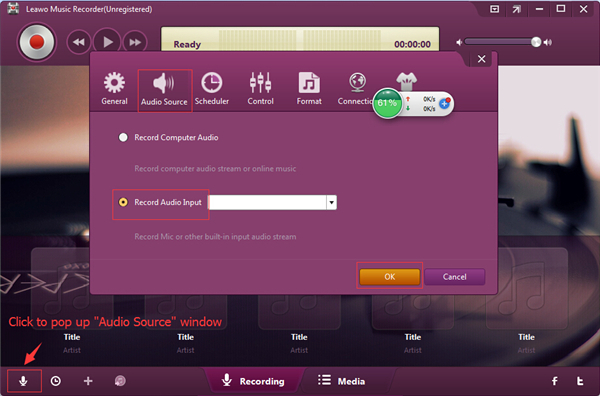 The effective solution is to use podcast recording software, Leawo Music Recorder. This software is very professional and can record podcasts to your convenience, and it also can assist you to download podcasts to iPod. Leawo Music Recorder can download podcasts in MP3 or WAV audio files. Thus, you can enjoy the podcasts in your iPod at any time you like. The first thing you need to do is download and install this amazing software on your PC. The following steps will show you how to download a podcast to iPod. 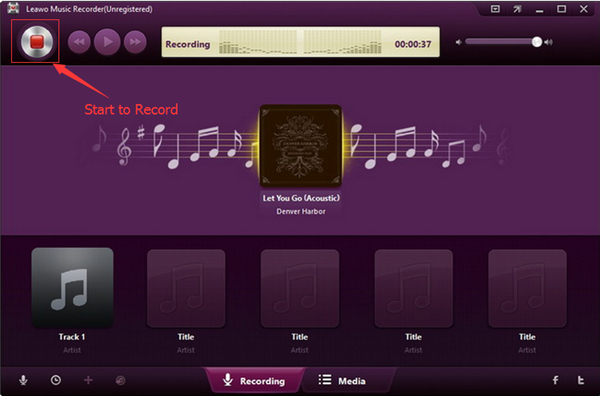 Launch Leawo Music Recorder and then tap the microphone button on the main interface. “Audio Source” panel will pop up and you can see two options: “Record Audio Input” and “Record Computer Audio”. If you want to download podcasts to iPod from browser, tap “Record Computer Audio”. 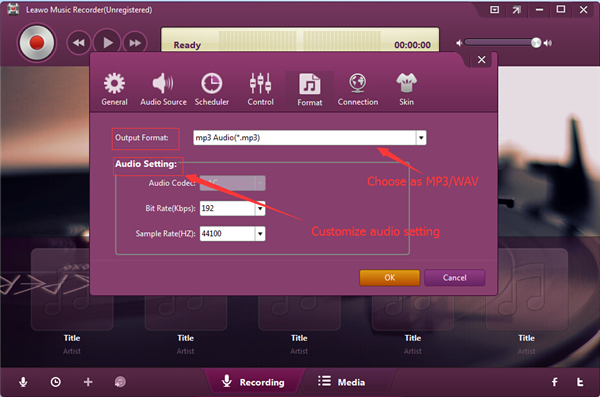 After that, click “Format” to choose the “Output Format” from the drop-down menu, such as MP3 or WAV. 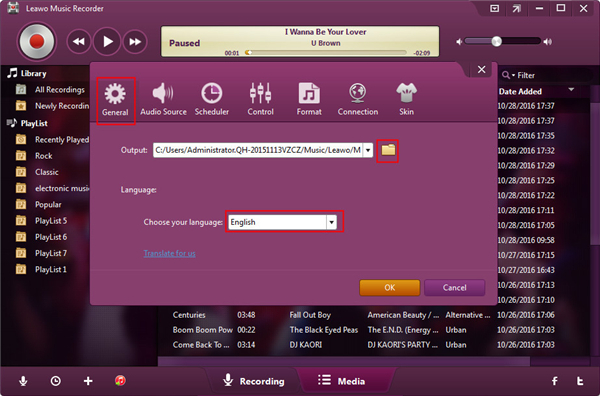 Then you need to set the audio code, bit rate and sample rate by using the “Audio Setting” function. And then you need to click “General” to set the output path of the recorded file and choose the language you would like to use. 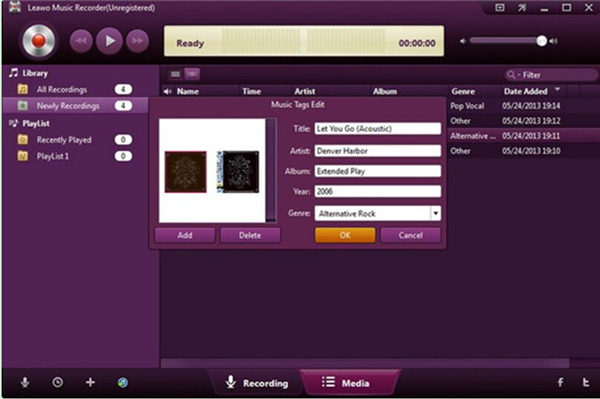 Go back to the main interface of Leawo Music Recorder and tap the red button to start recording, and simultaneously play back podcasts online or your iPod to let Leawo Music Recorder record the podcasts. When the podcast is over, click the red button again to stop recording. 1. If you’re downloading a song podcast, you will find that Leawo Music Recorder has automatically downloaded and added music tags for you, including title, artist, album, cover, year and genre. 2. If you want to edit the information of the podcast, you need to right click the podcast file to enter into the “Music Tags Edit” panel to change or add the tags manually as you like. And finally click “OK” to finish your operation. In the “Media” column, you can select the tracks you like and then tap the “iTunes” icon to add them to iTunes. You can also right click the selected tracks and tap “Add to iTunes”. Then your downloaded podcasts would be added to iTunes library. This magic software can solve the problem of “how to download podcasts to iPod Nano” perfectly, and you can have a try right now. After we download podcasts on computer, we need an easy-to-use transfer tool to transfer them to iPod. When it comes to a professional solution to transfer podcasts to iPod, Leawo iTransfer is no doubt the top choice that can be used to transfer files like music, podcasts, movies, contacts, ringtones, etc. 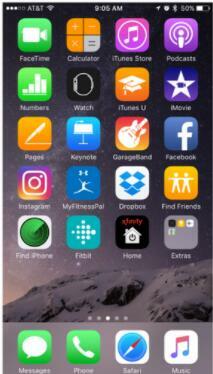 between iOS devices, iTunes and computers. 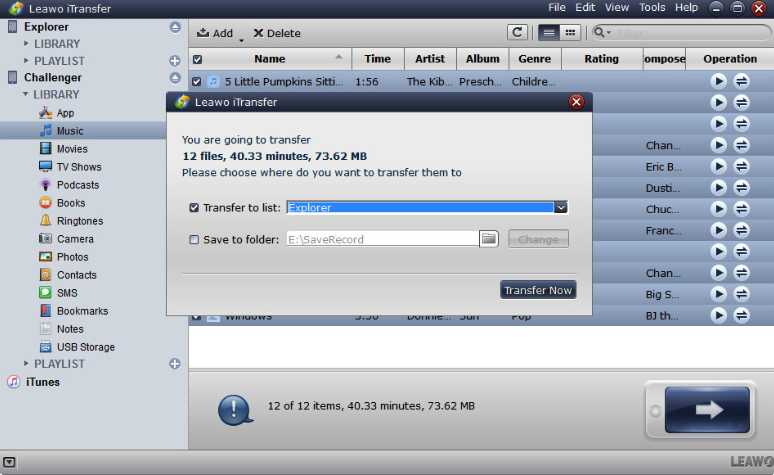 Different from iTunes, Leawo iTransfer can get users access to transfer non-purchased item. Download and install this iTransfer on your computer. As for how to transfer podcasts to iPod, let’s see how. Insert iPhone to computer via USB cable and then launch the software. In the left sidebar appears iPod library. Go to iPod > Library > Podcasts, then you will see iPod podcasts in the right interface. Click File > Add > Add file/folder to add the downloaded podcasts from computer. Now transferring begins. You can see a percentage bar to show you the process of transferring. Remember not to stop the process. After it finishes, you can listen to those podcasts offline on your iPod.